If you have a soggy basement, you’re not alone. The American Society of Home Inspectors, based in Des Plaines, IL, estimates 60 percent of U.S. homes have wet basements, and 38 percent run the risk of basement mold. A pro cure can cost from a few hundred dollars to many thousand. But even if you’re knee-deep in water, don’t call your banker yet. You can solve most wet-basement problems yourself for significantly less than you’d pay a professional. The key is to determine which of the three major problems you have: condensation, runoff, or subsurface seepage. Simple cures: Start with the easy stuff. If you have a full basement, air it out by opening windows and running fans. Also consider installing a dehumidifier (about $230 for a heavy-duty unit that will process 50 pints in 24 hours), ideally in a spot near easy drainage. Some experts argue that lowering the humidity in a basement will draw more moisture in, because moisture naturally migrates from higher humidity levels to lower ones. But as Chris Carter, of Ever-Dry in Fort Wayne, Indiana, explains, “The dehumidifier may draw in 10 to 20 percent more moisture, but it can easily process it.” Bottom line: a drier basement. During colder months, turn up the heat in the basement. Also insulate all cold-water pipes with foam insulation to keep moist air from contacting them, and be sure the clothes dryer vents to the outside with no duct leaks. Finally, don’t dry clothes on a line in the basement or store wet firewood there. Severe cases: If you continue to see moisture after trying these cures, then you’re not dealing with condensation. Rainwater or melted snow that isn’t routed away from the house is the most common cause of basement and crawl space moisture. Runoff percolates through porous topsoil and then stops at the compact soil near the base of the foundation. 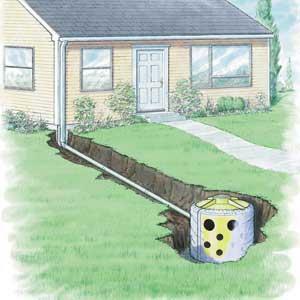 Hydrostatic pressure forces the water through gaps or cracks in walls and footings. Water also moves through porous walls by capillary action. 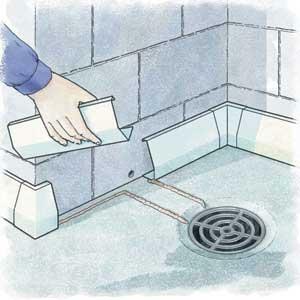 Look for ways runoff can enter your basement or crawl space. Check that the ground outside slopes away from your house at least 1 inch vertically for every 1 foot of horizontal travel. 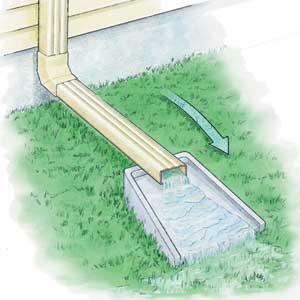 Then make sure downspout runoff isn’t pooling or percolating into soil near the foundation during a storm, and that downspout seams aren’t leaking; installing downspouts seams-out makes this check easy. Simple cures: If you’re dealing with a full basement, start by patching cracks in the foundation and sealing basement walls. Use a polyurethane masonry caulk. Also clean gutters so they won’t overflow. (If your home is not equipped with gutters, install them.) And make sure the soil around the foundation slopes away from the house 1 inch per foot for a distance of 4 feet. And add downspout extensions if needed so gutters drain 4 feet away from the house onto splash blocks. Instead, drain rainwater from gutters into a dry well a hole lined or filled with gravel or a tank that allows runoff to soak into the ground slowly. The Flo-Well system (about $150), which features a plastic tank wrapped with polypropylene fabric to block silt, is a typical residential dry well. It can handle runoff from a 500-square-foot section of roof. Install a dry well at least 10 feet from the house in a hole 3 feet deep. Then cover it with soil and put a plant on top to mark its location should the system back up. Planting grass alongside your house is another way to absorb excess water. But don’t plant trees; their roots can damage the foundation and an underground drainage system. 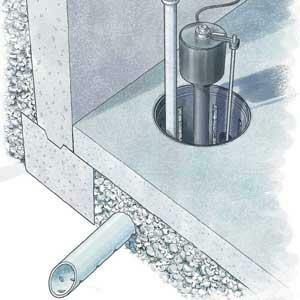 If your wet-basement symptoms act like runoff but occur all the time, you’re probably dealing with high groundwater. Diagnosis: Unless the foundation is surrounded by soil that has a high clay content, which can hold rainwater and snowmelt for months, runoff problems usually come and go as storm water drains away. But if your basement is consistently wet long after a storm, or if water is flowing through your walls or bubbling up where the walls meet the floor, you probably have a subsurface water problem. Check with your city or town to see if the water table is unusually high in your area or if underground springs are common.